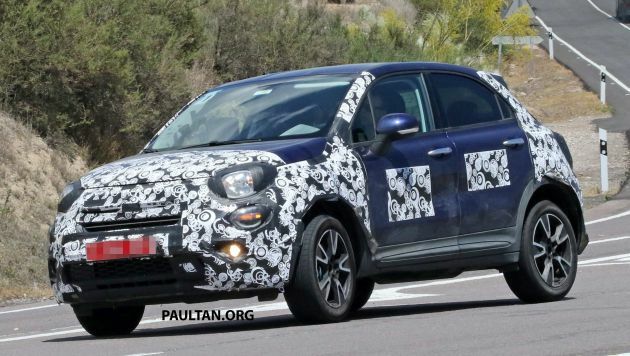 The Fiat 500X crossover has been around for a while now – a little under four years to be exact – and the compact Italian appears to be ripe for a mid-lifecycle update, as spotted by our spy photographers. This update will see modest changes applied to the exterior of the 500X, as suggested by the camouflage worn by the test mule pictured here. Its headlamps get a new design alongside a larger grille, while a redesigned front bumper gains new air intakes as well as round foglamps. The smaller, auxiliary lamps beneath the headlamps also get revised and will be LED units. The back end gets similarly modest updates, with revised tail lamps receiving colour-coded inserts as seen on the recently updated Fiat 500. Also as indicated by the camouflage shrouding, the rear bumper will receive a minor redesign as well. Although unseen here, the 500X interior is set to get updates as well, even though it has received minor changes for 2018. Powertrain-wise, the 500X should get a mix of petrol and diesel units – in 2014 debut guise, the 500X received six petrol units ranging from 120 hp to 184 hp in output, along with two diesels producing 95 hp and 140 hp, respectively. The facelifted Fiat 500X will likely make a 2019 debut. Last time you were oso bashing Fiat for being unreliable and expensive to repair. Now dah ikut boss buat Utun kah?